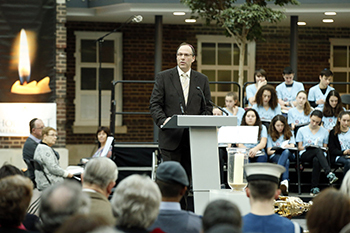 Hundreds of people filled the Rickett Quadrangle at Middlesex's Hendon campus to 'Keep the Memory Alive' ahead of Holocaust Memorial Day. The Mayor of Barnet Councillor Hugh Rayner and members of the local community were led in commemoration of the events of the Second World War by LLB undergraduate Joseph Stoll, who spoke on the importance of remembrance. As well as leading the student team at the University's Legal Advice Centre, Joseph is the UK campus director of StandWithUs, an international non-profit organisation dedicated to combating anti-Semitism. 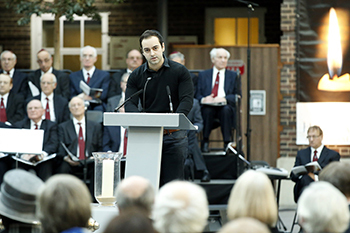 During his speech, Joseph read a letter that he had come across in a module handbook on his first day at Middlesex written by a student survivor of the Holocaust. It was something she penned to all her teachers throughout her education and outlined the importance of teaching people to be human – reflecting on the fact that many who committed atrocities during the war were learned people. Joseph went on to outline his and Deputy Dean of the School of Law Professor Brad Blitz's plan to build relationships between survivors and students, in partnership with StandWithUs and the Union of Jewish Students. "[We will] teach students to learn from the past, to help pursue a better future and to further keep the memory alive," Joseph said. Professor Blitz, who also spoke at the event, said Middlesex University was the ideal place to hold the commemorations. "Barnet is among the most diverse of London's boroughs and is home to the largest concentration of Jews outside Israel and the US, as well as large numbers of servicemen," he said. "Middlesex University sits in the very heart of Hendon's civic centre, next to the Town Hall and Library. A British institution, with a long history, the University embraces diversity and is a welcoming place for all, and was chosen to host Holocaust Memorial Day for these very reasons." 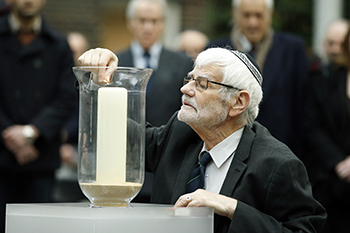 This year's event was particularly significant, as it marked the 70th anniversary of the liberation of the Auschwitz-Birkenau concentration camp and the 20th anniversary of the genocide at Srebrenica, Bosnia. Click here to listen to a specially arranged version of the Jewish hymn 'Adon Olam' by David Solomons and performed by a quintet from the resident Firebird Orchestra to close the event.